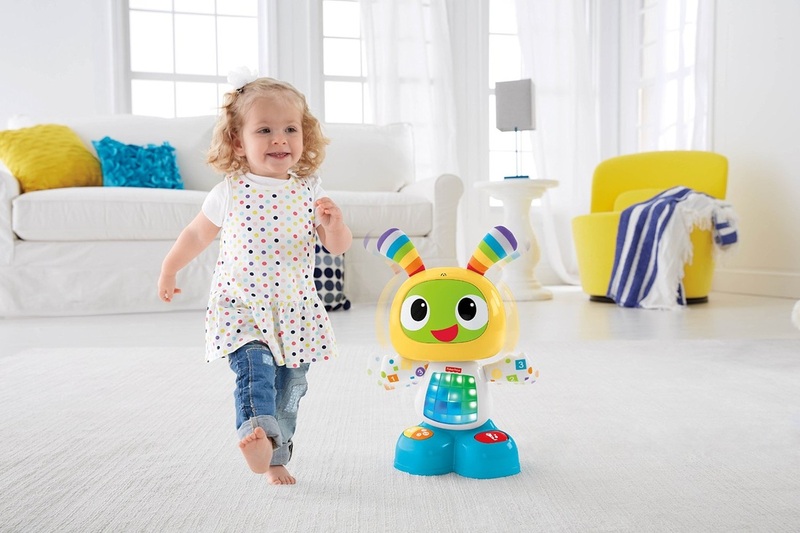 Since 1930, Fisher-Price has been bringing children and their parents innovative, educational, and fun toys – and the Bright Beats Dance and Move BeatBo is no exception. ​Yes, the name might be a bit of a mouthful to say, but BeatBo is a simple to use toy that offers hours of music, dancing, and learning experiences for your baby. This means that you can change its function as your baby grows, develops, and learns. BeatBo provides hours of entertainment with its upbeat music and dancing motions. Uses colours, textures, and sounds, and songs to help your baby learn the alphabet, names of different colours, and how to count. Record mode allows you to record phrases for BeatBo to repeat, and the light-up tummy panel with colourful LED lights is sure to mesmerise your little ones. User reviews for this little guy have been overwhelmingly positive. With this toy, the whole family will be dancing along, encouraging baby to move and develop motor skills. Alphabet, counting, and colours are introduced through music and dancing, taking the drudgery out of rote learning. It’s so much fun to hear BeatBo remix your words and phrases into your baby’s favourite songs. Even younger children can develop their verbal skills by hearing their own words repeated back. It’s excellent for a wide age range: children from anywhere between 6 months and four years will enjoy the music, lights, and movements. The toy is great for teaching cause and effect. For instance, when children press BeatBo’s tummy or the three foot buttons, something random happens and they will wait with glee to see what BeatBo does next. It is versatile enough not to bore children. Siblings will enjoy playing together and experimenting with BeatBo’s programs and functions, while moms, dads, toddlers, and babies can all groove together. This makes BeatBo great for family time. It also helps children to develop a sense of belonging. This is not a quiet toy and some parents found the music and sounds repetitive or disruptive. You have to remember that having children in your life is inviting noise into your home and that repetition is essential in early learning. A quiet toy would unlikely be as educational or as entertaining. So embrace the noise! It’s doing your baby or toddler a world of good. Best buy toy for Christmas 2015? BeatBo will be your baby’s new best friend and it will bring hours of music, movement, and fun to your home. ​It also gives your child the best possible start to a lifetime of learning. ​If your child is anywhere between 6 months and 4 years old, this interactive robot toy will be an asset in your home.